This article is 2758 days old. 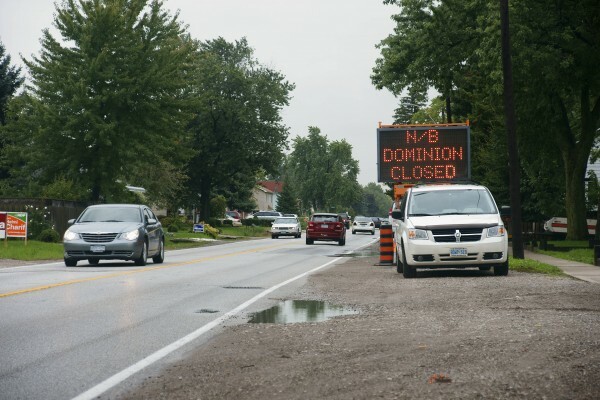 Originally scheduled to begin last Wednesday, but delayed because of heavy rain, construction on Dominion Boulevard’s new sidewalks will get underway Monday morning. The north bound lane will be closed starting at 9:00 am from Ojibway to Northway. For those living on the east side of Dominion Boulevard in South Windsor, not having a sidewalk has meant no door to door mail service. As part of the city’s budget deliberations in April, a budgetary placeholder was made to allocate funds for sidewalks to be installed on this section of road between Northway and Totten. At a cost of $275,000 the new sidewalk will allow the 63 houses on this stretch to have mail service again, and will also provide a safe walking path for neighborhood schools. The closure will last for four weeks.